Another day, another point update from Wandle Software… This time for for www.cut. 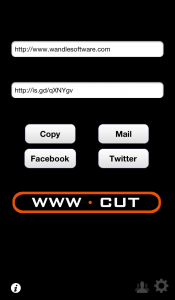 As with the recent change for Rootn Tootn, www.cut 3.1.2 is all about the new iPhone and iPod touch. It features support for the new screen size and a couple of small bug fixes, including an update to the “get title” library that I use. The bad news is that, as with all updates to iOS apps, you’ll have to wait until Apple have reviewed and approved it. At this stage I would guess that it won’t be for Day One of the iPhone 5 but, hopefully, it will be shortly afterwards. Keep an eye on your App Store app (or Twitter) to find when it makes it into the wild. Update: As of the 20th September, it’s on the App Store.